Silhouette Cameo Vs Cricut - What to pick? We have talked about Silhouette Cameo vs Portrait on previous post, now we’re going to make comparison between Silhouette Cameo vs Cricut. The world of paper crafting has a lot to offer by way of creativity, and die cutting and paper cutting machines are no exception. Traditional dies abound with the latest and greatest machines that offer the most versatility while spending less. But tradition machines still require dies in order to cut paper. Two electronic cutting machines are the cream of the crop: the Silhouette Cameo and Cricut. If you’ve been pining over purchasing one of these machines but don’t know which is best for you, the information provided here may help make your decision a bit easier. The Silhouette Cameo is a cutting machine that works with your home computer. Mac or PC? Doesn’t matter, software is included for both types of computers. With the use of software on a computer comes the ability to cut most images that you can download, fonts from your computer, design on the computer yourself, and includes the ability to manipulate the images on a digital mat before you even touch the cutting mat. It also includes an optical sensor, which allows the machine to cut out printed images. The Cameo doesn’t use cartridges or dies, which most other types of cutting machines require, but does include 50 designs for a crafter to start with. What it does need to operate is a connection to a computer, which is ideal for us in a home studio or craft area. Silhouette offers plenty of images available for download. Cost is about $0.99 per image. 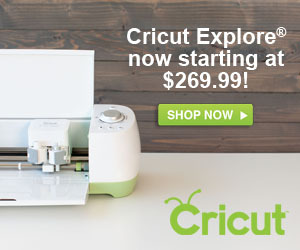 Cricut offers a cutting machine that utilizes cartridges to cut images, and also offers Cricut Craft Room online that allows crafters to design projects digitally and send them to the machine to be cut. Depending on where it’s purchased, this machine can come with 2 full cartridges of images/fonts to start. Cartridges can be purchased physically or digitally. Cartridges offered can range in price depending on the quantity of images included or sale: $15.00-$50.00. This machine can be used in the comfort of home with either cartridges or the Craft Room digital options, but can also be taken on the go for crafters who spend time crafting outside the home as well. Cartridges are an easy way to cut most anywhere, but the Craft Room is available most anywhere you can take a laptop, or have access to a computer. Both the Silhouette Cameo and Cricut offer similar cutting capabilities, being able to cut a wide variety of materials. Both use similar cutting mats and blades to cut projects, which will require replacement over time. Both machines are within a similar price range as well, again depending on where you purchase the machine. Well, that would depend on what you intend to do with it and more importantly where you will be crafting. Crafters who work primarily in a single location, have access to a computer regularly, or want to design their own elements will probably want to work with the Silhouette. Crafters who use their talents in more than one location, who may not have regular access to a computer, or may not desire to create or find their own images to use will likely find the Cricut a better option. Both machines offer excellent resources, creativity, and design choices.